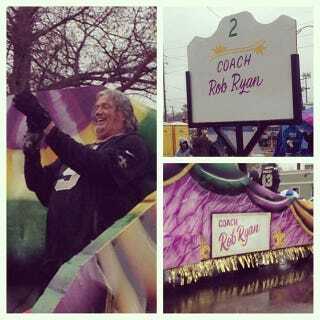 Saints defensive coordinator Rob Ryan was named the Grand Marshall of a Mardi Gras parade, and judging from the reports and photos, Ryan had a fantastic time despite the rain. Near the corner of Severn Avenue and 19th Street, a man in an LSU cap jogged alongside Ryan's float with a Krispy Kreme donut in his outstretched hand. "Rob!" he shouted. "Catch this!" Ryan hung his giant hand over the side of the float, and snagged the high-calorie treat out of the air. The crowd burst into cheers. Some lucky ladies took a photo with Ryan last week when he was dressed up in a suit for other festivities. There was also a group of fake Rob Ryans at the Krewe D'Etat parade last week. Camille Young took a video of them in all their belly-rubbing, shuffling glory. So yeah, New Orleans seems to love Rob Ryan.